Ken specializes in the older, urban neighborhoods � historic homes, new urban condos � and has vast experience not only in marketing, but in renovating these classic treasures of the Columbus area. 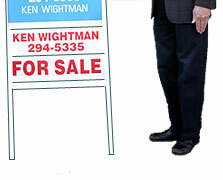 With 20 years of experience and over $100 million in sales, Ken is one of the top Realtors in the Columbus area. If you want experience and knowledge, call Ken at (614) 294-5335, email him at kwight@ee.net or go directly to Current Listings. 3 Story, Wide Open Contemporary Condo!